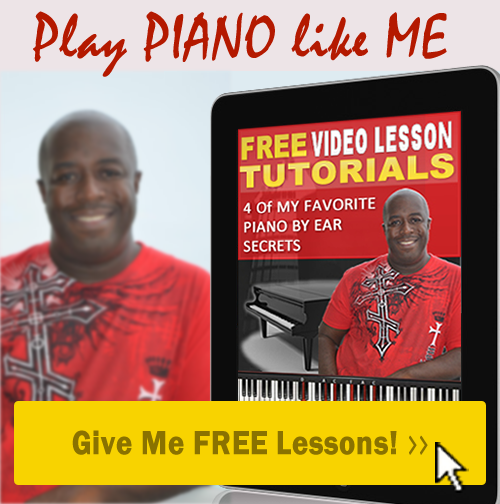 Gifted Player Piano Lessons By Ear Learn how to play Pop, Gospel, Jazz & Contemporary Christian piano by ear without sheet music. Often times musicians struggle with transcribing even the simplest tunes. The truth of the matter is, many chart busting hits aren’t available in sheet music. If you’re performing on a regular basis and your band or church is demanding that you learn song you’ve never heard on the fly, lacking the ability to transcribe a song from an audio track will leave you frustrated and looking for another gig. If you’re struggling playing piano by ear, here’s why. You never learned the four secrets that professional musician use to listen to any song and instantly play piano by ear. You may think that they have some sort of extra-ordinary hearing ability. Not so! The video below reveal this process; it will give you the insider secrets to playing piano by ear. Today you will know the secret as well. Watch as I personally demonstrate the art of transcribing a song by ear.